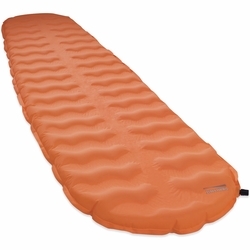 Therm-a-Rest EvoLite Sleeping Pad. Air mattress fans rave about ultralight compactness, while self-inflating mattress fans hold fast to stable comfort and convenience. Well, what if you could have both? Enter the all new EvoLite mattress. Its patent-pending AirFrame™ construction combines the ultralight, high-loft comfort and compactness of an air mattress, with the convenience and stabilized comfort and support of self-inflation, creating the next big leap in camp comfort innovation. 2-inches (5 cm) of loft deliver bump-swallowing comfort while the exclusive Atmos™ Foam beams add stability, support and excellent self-inflation performance, leaving just a few breaths to top it to your desired firmness. And of course, it’s ultralight and compact enough to keep it squarely in the realm of those looking to move with a minimum through the backcountry. Stuffsack included.